We all know one or have seen one or you actually may be one of them. You know if you are one of those Piecer People! I am always on the lookout for remnants of them and sometimes, I have the pleasure of being given one to look at and figure out what to do in order to finish it in a manner that the Piecer would have been pleased to see. Orphaned quilt blocks are found nearly everywhere and when I find them I like to ponder what the Piecer's vision was for the blocks. Did she or he use scraps of fabric that had a special meaning, or were the fabrics chosen based on a planned color theme? Were the moments spent in stitching thinking of how beautiful the finish would be, did the piecing help him or her get through some difficult times, or was she or he thinking of the smiles on the face of a person who would be receiving the finished quilt? Did the years pass as quickly by for them as they do for me? And before you know it, decades have passed but the blocks ever so patiently wait for you. The above quilt was worked on for decades by the same person. 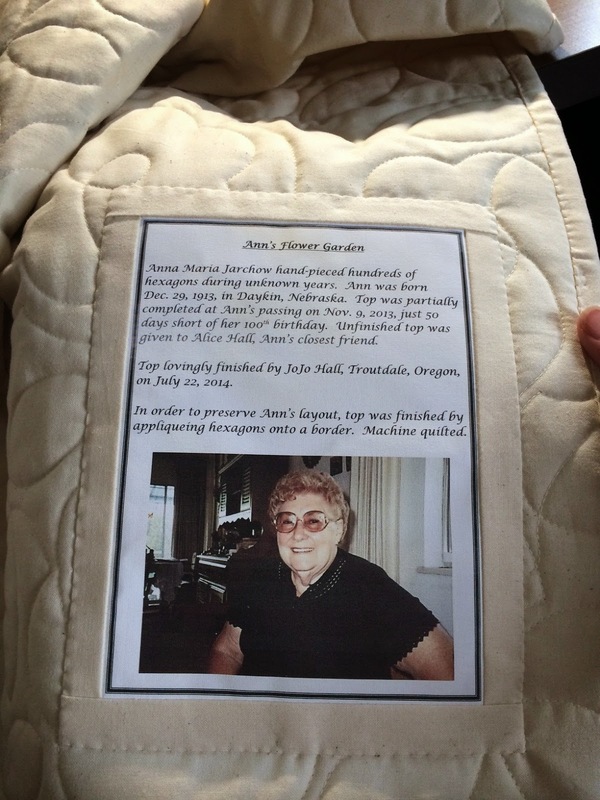 Her name was Ann and she, as all us Piecers do, worked on and finished many quilts during that same time. This one however was never quiet ready for the finish line. She had just enough done that I could envision where she was planning on going, and with a tender heart, I laid out the blocks and strips on the floor...arranging and rearranging until nearly all of the blocks were used. I thought she was so creative by adding in the purple diamonds among the flowers. And just like we all have done, she had at one point ran out of the purple fabric and when she went to buy more, the exact same purple was not available so she did as we all do --- picked another purple and kept on going, and you know what? It worked just fine. Here's a picture after I had joined all of the blocks together into the final top. The symmetrical side of me so wanted the left and right sides to match but there wasn't enough blocks. I contemplated leaving off the left diamond side but then it just didn't feel right and I think I actually felt Ann's whisper of it's okay that it doesn't match. I also could not make myself cut off one piece of the top as you see it so I floated the top onto a background fabric that closely matched the cream fabric and appliqued the whole top to it. LOL. Let me tell you, I love a good challenge, but I paced the floor trying to decide how I was going to accomplish what I had just decided to do. It was a little overwhelming, but I took my time and sewed inch by inch until I made it all the way around. This is the first top that I've done where I was able to know about the person. Wouldn't it be wonderful if we could figure out a way to preserve information about ourselves into our own blocks for the next Piercer. Although, I must say that with Ann's quilt even if I had not had knowledge about her, I completely felt her throughout the whole process and like to think that she guided my hands to the finish line so I was just the instrument that was used. I have a very emotional connection to all of my quilts and that may be why I wonder about the things I mentioned. I tend to leave a piece of myself in each and every project. I would love to say I will finish all of the projects that are in my head and heart, but I know I will not. I do hope that a person just like myself will eventually find my treasured blocks and do as I have done and finish them. And I pray that the love that we both put in them will shine and give joy to those who wrap themselves up in it. What a story of the Heart! How did you know this lady? I know every quilt has a story. That's why I blog about all of mine just in case someone wants to read about them after I'm gone. I put as much info on the label as I know also. The picture is a great addition.